What originally starts out as a meteor shower is revealed to be a full-on "invasion" by Vestrons. 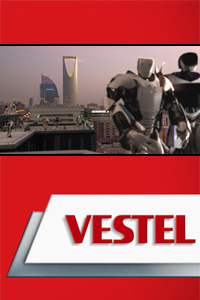 As the company Vestel is now exporting their products to the Middle East, the armada of friendly robots spread out all over Dubai in order to kindly provide their household services to the population. Within an extremely tight postproduction schedule, I was personally involved in creating the digital environments for a few of the shots, recreating city vistas based on stills and plate photography and populating robots across city rooftops.